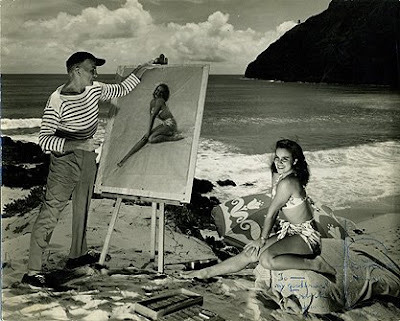 Today we look at another pin up artist of lovely girls in swimwear, Rolf Armstrong. Rolf Armstrong (1889 - 1960) was a pinup artist of the 'good girls'. He was born in Michigan and studied art at the Art Institute of Chicago. From there he traveled to New York and studied with Robert Henri. After that he traveled to Paris to study at Academie Julian and then returned to New York to set up a studio where he began to paint the Ziegfeld Follies girls. During the 1920s and 30s he began producing artwork for magazines with some of his models being Mary Pickford, Greta Garbo, Marlene Dietrich and Kathrine Hepburn. He produced calendars, magazine covers and advertisements to promote products. He died in Oahu, Hawaii. This is a picture of him in Hawaii painting in the outdoors which he preferred for the natural lighting. There is a book out on his art called 'The Dream Girls'. You can find it here. oh wow. I love his style. these are quite beautiful. One of my all-time favorite artists! Wow... those are lovely! I especially like the first one. Wasnt' he a wonderful artist?